In Meet Me There follows Ashlyn and Luke, two people who couldn't dislike each other more. Luke has spent too much time pulling pranks on Ashlyn for her to see anything beyond his need to embarrass her. When she meets an unknown British man in a dark lab, she starts to fall for him, not realizing it's another deception by the boy she wants nothing to do with. Without the preconceived ideas of who Luke is, she gets to know the real boy. But when she finds out who he is, will she remember those times in the dark or want nothing more to do with him? The characters are great. They're easy to like, even Luke with his deceptions. I was truly rooting for them. There's an added emotional layer in this book fueled by things neither of them want to tell the other. It makes it more than simply a YA rom-com. I wish there was a bit more originality, or just a bit "more" to this story. It plays out predictably - which isn't necessarily a bad thing. A cute story any fan of YA romance will fall head over heels for. 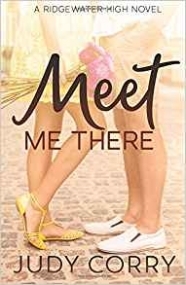 'Meet Me There' by Judy Corry follows main characters Luke and Ashlyn. They don't get along too well, especially since he likes playing pranks on her, and she tries to best him with each one. When he gets the opportunity to play out the biggest prank of all - pretending to be someone he's not, with Ashlyn none the wiser - he jumps at the chance. Little does she know that the endearing British boy she meets in a dark classroom is actually the bane of her existence - or so she thinks. The fact that they get along so well despite never having seen each other is mysterious and energizing to Ashlyn, and Luke's fake accent is helping the mystery to stay alive. The trouble is that when he comes to appreciate Ashlyn as more than a nemesis with whom he can spar, he doesn't know how to get out of the conundrum he's created for himself. Getting rid of British Boy proves harder than Luke thought possible. The chemistry between Luke and Ashlyn is strong, yet they - and most especially Ashlyn - do their best to hide their growing attraction to each other, especially when British Boy, no matter how fake he might be, is still in the mix. When Ashlyn learns the truth, it affects her in a way she didn't expect, and the way she deals with it brings up unexpected results and even more unexpected truths about what she expects from life and from herself. Corry has written a sweet contemporary romance that has a good dose of anticipation built in. Any lover of young adult stories and/or contemporary romances will thoroughly enjoy this novel.